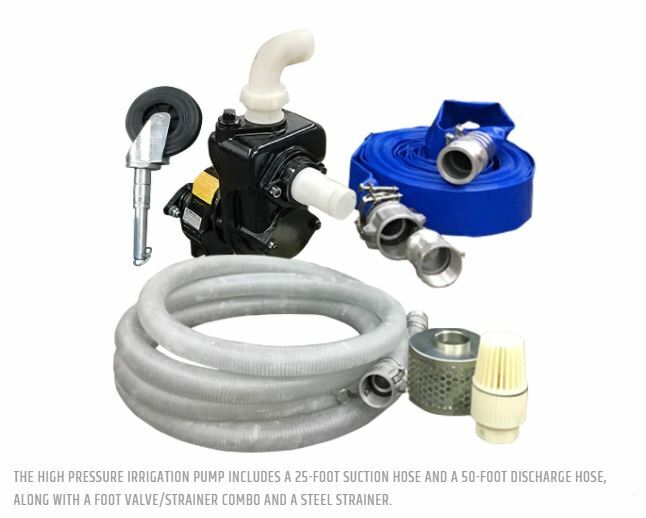 As its name implies, the Hi-Pressure Irrigation Pump moves water farther and higher than typical pumps would deliver. It’s better for sprinkler systems and other irrigation applications when compared to BCS’s Water Transfer Pump. The light and compact 85-PSI pump is manufactured by Rovatti of Italy (model M0-50A) and is easy to install. 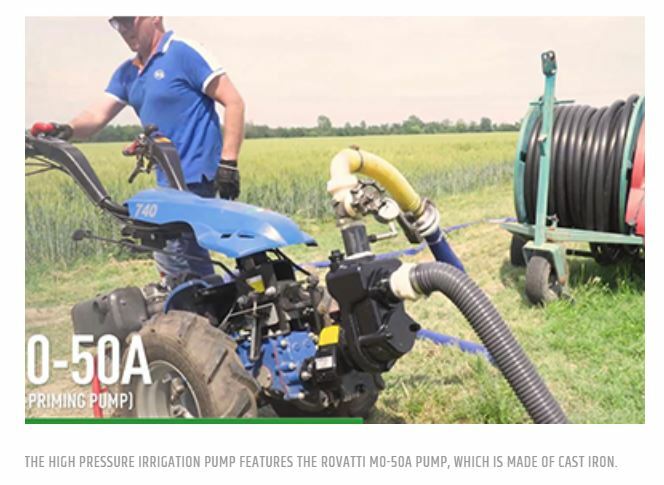 Unlike the Water Transfer Pump, it does NOT require a Power Cradle accessory to increase RPM of the tractor PTO. Constructed with high quality cast iron, the pump incorporates heavy duty helical gears, oil bath lubrication of the bearings, and a high-quality mechanical seal, which collectively yield high efficiency and a reliable, maintenance-free operational life. The pump has plastic intake and outlet fittings, with 50′ discharge and 25′ suction hoses with cam lock fittings. A foot valve/strainer combo and steel strainer are also included with the unit. The foot valve has a screen around the foot to keep out larger debris, and prevents drain back to maintain constant priming. It also has a caster wheel for easy maneuverability. In addition to irrigation applications, the pump can be used for dust suppression, remote area fire fighting, washing equipment, and more. The max total head is 220 feet and the suction lift is 26 feet. Comparatively, the Water Transfer Pump’s total head is 115 feet and suction lift is 28 feet. For more information comparing this pump to the Water Transfer Pump, click this link. Attachment price only. See compatibility chart for compatible tractor models. Better for irrigation applications than Water Transfer Pump. Maximum of 85 PSI and 145 GPM. Maximum total head of 150 feet. Manufactured by Rovatti (model M0-50).